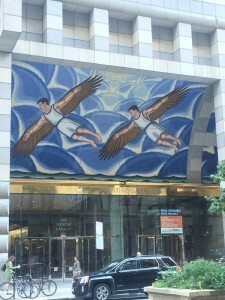 Above the doorway at 120 North La Salle Street a mosaic depicts Daedalus, together with his son Icarus, soaring high in the sky on the wax wings he designed and built. 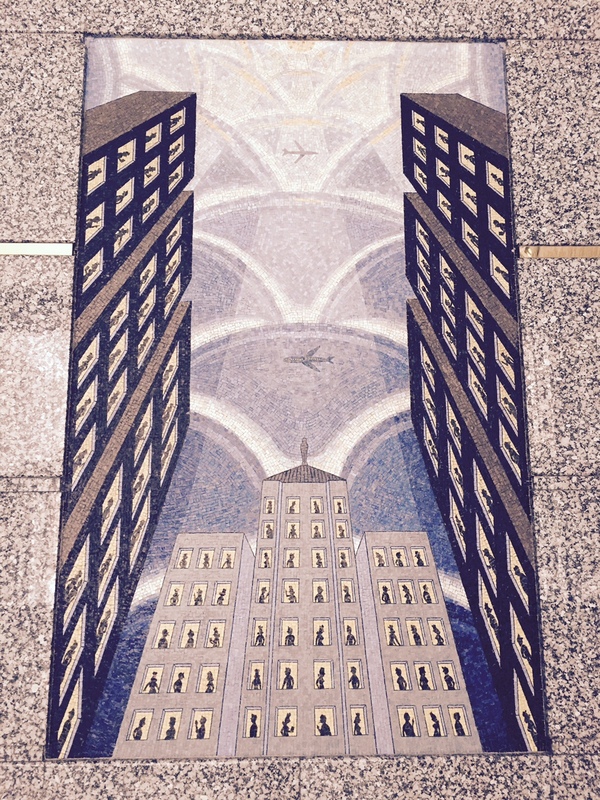 Inside the lobby a second mosaic presents jet planes flying above the Chicago Loop’s epicenter, the Board of Trade. 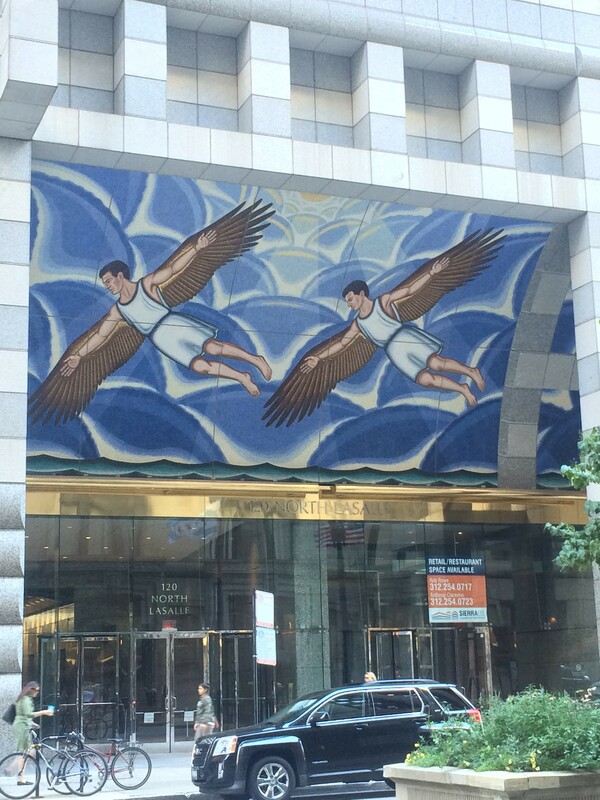 These mosaics by Chicago Imagist artist Roger Brown juxtapose Chicago’s signature excellence in architecture and infrastructure and the creative genius of Greek mythology, Daedalus. Brown’s use of myth suggests the permanence of the human struggle to combine art and technology, as well as its delights and dangers. The compositions evoke the pleasures that attach to human creativity applied to concrete needs. Daedalus and Icarus are in flight against a bright blue sky and in the light of the sun. The planes high above glorious architecture are populated with lively figures in every window. But Brown’s initial plan for the composition can clue us in to his interest in more complex thoughts. The first plan, rejected by the architects, focused on the part of the myth in which Icarus plummets to the ground and perishes as a result of having ignored his father’s instructions not to fly too close to the hot sun in wings made of wax. In the revised composition installed in the building, Brown must rely on the viewer’s knowledge of the well-known myth to provoke a layered response. The companion mosaic also signals the dangers of hubris but in a clever way; the planes above Chicago are stuck in a holding pattern, circling. The mosaics are located in a striking 40-story contemporary office tower directly across the street from the imposing neoclassical Chicago City Hall at 121 North LaSalle Street and a short way down the street from the Board of Trade building flanked by two temples of finance. The pair of mosaics contribute to an extraordinary feature of this part of the city that Brown expressly adored–the way neoclassical and modernist architectural gems coexist in harmony on a block dense with notable buildings. This is a democratic feature of Chicago in Brown’s view. 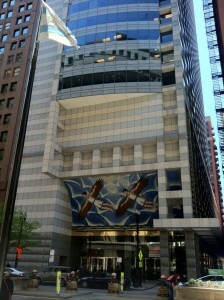 It is a principle on display in the renovation of the building that houses the Roger Brown Study Collection at the School of the Art Institute of Chicago where Brown was on the faculty for many years. 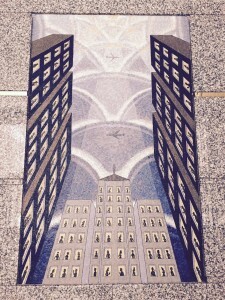 Both mosaics were commissioned by Ahmansion Commercial Development Company, a subsidiary of Home Savings of America, and the architectural firm Murphy/Jahn Architects. They were dedicated on July 29, 1991. The murals were made of Italian glass mosaic created by the Travisa Mutto Studio near Venice.